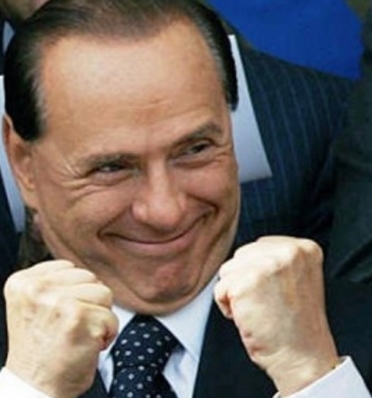 Hold on to your hats kids – Silvio has just been allowed to stand for parliament – the conviction of incandidatability having been quashed. In the midst of the negotiation between 5S and the Lega to form a government, Silvio has got a new lease of life – and will no doubt now form an opposition to the whole shebang, convinced that he will win in the next elections..
Salvini must be really hacked off this morning, while the left will be wetting themelves with glee as they now have a common enemy. For Salvini the formation of a government with Silvio on the sidelines was a gift from on high – if he could limp on for a few years, Silvio would be either too old or dead and Salvini would become de faacto, the leader of the right. Now with this news his plans are shot down. Yesterday , although his staff denied it, Silvio went on record to say that he hoped the new government would fail as they would bring in a wealth tax. Now able to stand for parliament, Silvio can work behind the scenes to bring down this fragile coalition – having stod apart on the basis that there would be no antiSilvio laws – and then run as PM on the ticket of being ancient and confused. He no doubt sees a meeting of the greats – ie – him and Trump – where they can each boast of their huge hands and make really crap jokes to the assembled press corps. For Italy this is slightly more worrying – remember Berlo is best buddies with Putin. It means a great thrust forward to get a government of M5S and Lega to prevent the saggy one making a comeback, while Berlo will do all he can to bring on early elections – not in July when all his voters will be at he seaside, but after the summer, when he can say how ineffective the alliance has been. Salvini must be choking on his cornflakes this morning, while Grillo and Renzi will be jumping for joy on thier respective mattresses. Posted on 12/05/2018 by rammers. This entry was posted in Uncategorized. Bookmark the permalink.